2016 was certainly an interesting year, if I had to sum it up in one word I would say CHANGE! I certainly had lots of changes on both personal and work levels, but as I look back I realise they were all positive changes. Some still in progress. It was only when I reviewed my year in blogging, to join Where Wishes Come From blog linky, that I realised just how much has happened in this year. That is the great thing about a blog… it acts as a type of record or journal, documenting things that could otherwise so easily be forgotten. The most popular post on the blog from 2016 is a personal favourite, How high do birds fly? This infographic brought Dr. Simple to a new level, when his twin sister was introduced. I really like the end result. It always surprises me how many people search this question on a daily bases, I hope the post is of some help to them. It is really hard to pick a favourite post, it is almost like picking a favourite child. I love writing posts based on a question I have been asked and I particularly enjoyed this one What would happen if the Earth’s gravity suddenly disappeared? It was a question asked by my son and it got the whole family involved in what they thought would happen! I tried a few different ways to share experiments this year, and I’ll cover that a bit later, but one of my favourite experiments on the blog this year was this one… Can water go uphill? It was great fun to set up and the resulting colours were so nice that I have to admit, we kept it on the counter for days as it was too nice to trow out. Definitely a cheery experiment for a dull day! I tried a few new things out this year, some of which used FaceBook Live. I have to admit that some of the science kits out there drive me nuts! I have seen far to many that are little more than a box and a poorly written booklet, nearly all the materials having to be supplied by the poor person who has already spent money on the ‘kit’. I won’t go any further with that rant today, but, on the plus side, this prompted me to share a series of experiments that you can do at home using just a plastic bottle. I used FB live to share a different bottle experiment each day, for ten days and then put them all together as my TEN SCIENCE EXPERIMENTS YOU CAN DO WITH A PLASTIC BOTTLE series; you can view them here and here. The videos are not very pretty or polished but I am proud of the fact that I did show how you can literally do ten experiments with a plastic bottle and I got some really great feedback from people who tried the experiments. I have always wanted to do a children’s science magazine. I spent a lot of time looking into it in 2016. The project has since taken on a somewhat different direction but we’ll see what comes of it all. However, I did put together a simple, free, on-line mini-magazine here on the blog and I absolutely loved the experience! It is so lovely to have this space to create and test and experiment and, looking back over 2016, that seems to be exactly what I was doing. You may have noticed that I have a new column with the Irish Examiner, called the Appliance of Science. Each column answers a question that I have been asked. I am really enjoying the column and exploring all the fantastic questions I have been sent. If I had to pick a favourite it would be my very first… Do Pigs Dream? I always love receiving your questions so please keep them coming! It was lovely to look back over all the photos I have shared, here, and on social media during 2016. There are so many favourites but this one in particular makes me smile. It is exactly why I started Science Wows in the first place and the kind of science I most like to see. This photo shows an impromptu bubble science session at the kitchen table. My youngest loves to go in to my science supplies and pick something to ‘experiment’ with. This day it was bubbles and they had free reign. I think you can see the interest and exploration written all over their faces. The best way to learn! I was delighted to attend 2016’s Inspirefest. It certainly lived up to its name, I am still talking about the event and looking forward to attending again this year. If you are thinking about it at all, I would highly recommend it. Here is a little of what 2016’s event offered. I was delighted to make it to the finals in the Irish Blog Awards (Science and Education Category) and had a fantastic time at the Circus themed Awards in September. My best blogging moment came however on 28th September when I won the Best Education Blog category in the Web Awards! All parents out there know how life with kids never goes as planned; so instead of hearing the news from the Award ceremony itself, I found out via twitter while putting a sick child to bed! Still, the celebratory ‘happy dance’ that the whole family did in the hall when I let out a shriek of delight makes a particularly wonderful memory for me for 2016. I love doing posts with infographics and although I didn’t do as many I would have like in 2016, I still did a good few. Perhaps my favourite is this one… Do bugs fart? I created this infographic while my kids played outside this Summer and I heard their question come through the open door. True story! It is a simple, quick post but there are some cool facts included. And again, it surprises me how this too seems to be a common question for google! I guess we all really need to know! Regular readers will know that I often do a series called ‘Mystery Creature’ where I post a photo of an unusual creature and readers guess what it is. At the end of the week I post the answer and a bit of information about the animal. I have featured some amazing creatures over the years but perhaps my favourite from 2016 is this one… the Epaulette Shark, a shark that can actually walk on land! We also have a fondness for frogs in this house. These little creatures are absolutely amazing! Although this post deals with a type of animal, rather than just one frog, it is another favourite in the animal section. These fifteen frog facts may just blow your mind! Looking back over 2016 I am delighted that Dr. How’s Science Wows has featured many times in the media, in print, radio and TV and for that I am very grateful. It was nice to feature on the Nuacht in November as I brought my Science of Sound Workshop around schools in Galway for the Science and Technology Festival. It also made me smile as I was quoted in an article all about the Science of Love for Valentines day! But my favourite media mention this year was this one… Meadhbh Mc Grath highlighted another side of blogging in the Irish Independent Magazine in November and I was delighted to be included (with a lovely photo with my youngest as we play with slime!). You could argue that this one belongs in 2015 as that is when I did the work for it; I am talking about the children’s science programme ‘Is Eolaí Mé’. I was delighted to work on this 22 part series for Irish television, working with the amazing team at Fibín Media. As scriptwriter and consultant I got to be part of many elements of the show which was just a fantastic experiment. And finally, in September 2016 I got to sit down with my family and watch the programme on Cúla 4, TG4 for the very first time. I really loved every part of the experience and I honestly feel this is a great resource for school, educators and families. You can check out the full series herehere. I definitely don’t think I had a common theme this year. I did try a lot of new things and there was a lot of change for Dr. How’s Science Wows so I guess I would use two words… EXPERIMENTATION and CHANGE! In a year of flux and change the blog has been a constant. It is always a place to come back to when I am unsure of the next step. Over the years it has allowed me to develop my writing and expand my knowledge but, last year in particular, it allowed me expand into new, uncharted waters, while still providing a safe harbour when I needed it. Most of all, as I realised when I first started to write this post, it has provided me with a place to document and busy and adventurous year. Here is hoping 2017 will allow some of these new adventures to move to the next level! Happy New Year and thanks for reading, engaging, supporting and following along with the journey! This post is part of a wonderful linky set up by Where Wishes come from. Click the badge below to check out her beautiful blog and all the other posts sharing their 16 from ’16. Science News Round up – February 2016. 1. This big, BIG story of this month was the confirmed detection of gravitational waves. 2. In the last week we heard that viable sperm was grown in-vitro; A team of scientists in China say that they successfully grew mouse sperm from embryonic stem cells and that the resulting sperm cells have been used to successfully fertilise an egg, producing healthy, fertile young. 3. We all know about the effect of global warming on our planet, but, just in case you were in any doubt… newly reported data shows that … “the modern rate of sea level rise in the 20th century is faster than anything we’ve seen in the previous two millennia“. 4. 3D printing took another step forward with this bioengineering transplant. A team of bioengineers in North Carolina revealed that they successfully printed an organic human ear and then transplanted it onto the back of a mouse, where it not only survived, but grew. 5. And finally… not exactly international news, but a nice little first for Science Wows; you may have noticed that I published a mini science magazine here (and here for a mobile version) all about the science of pancakes! I have had the idea for a children’s science magazine for a very, very long time; this mini magazine was my first realisation of that idea; With a lot of determination, hard work and luck, a full blown magazine may become a reality. So, if you checked it out, I’d really, really love your feedback; Please let me know in the comments below, or get in contact in other ways. These are only some of the science events from February, have you any more to add? Science News round up – January 2016. 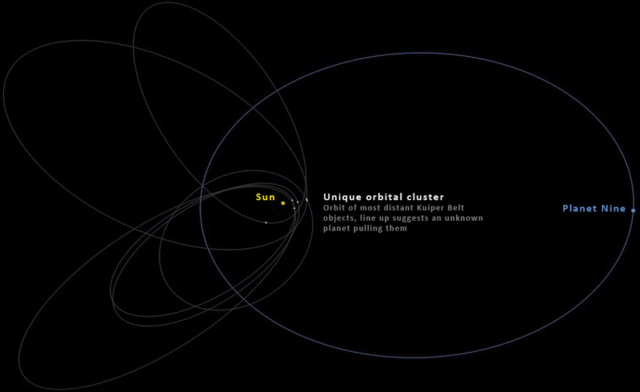 Planet Nine is a hot topic this month… NASA remains cautious and sceptical but others are very excited and on high alert. Some are even predicting if we could live there. And for some really BIG news, the biggest dinosaur fossil ever found, a Titanosaur, was unveiled at the American Museum of National History. For many of us not lucky enough to be able to attend in person, we got to see this spectacular species through our tv screens, documented by the wonderful Sir David Attenborough. For the first time in 11 years, five planets have aligned in the morning skies: Mercury, Venus, Mars, Jupiter and Saturn; Visible to the naked eye under the right conditions. The preying mantis got some funky 3D glasses and its own cinema, all in the name of science. 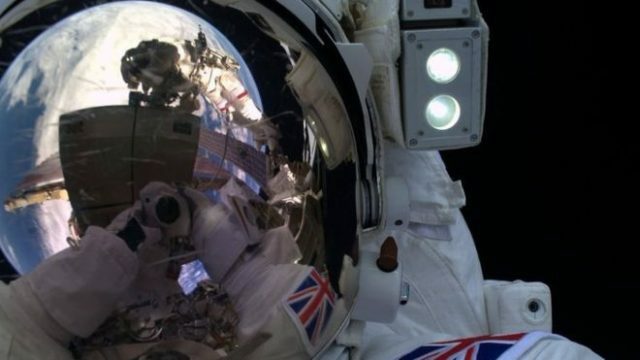 British astronaut, Tim Peake made history as he became the first UK representative to perform a space walk. He even tweeted a space walk selfie. I wonder what stories will unfold in February. Do you have any favourite science stories from the news this month?